Rhode Island’s “home team” in the upcoming Volvo Ocean Race (VOR), Team Alvimedica, has confirmed seven of the eight sailors on their roster for the ‘round-the-world race, as well as the On-Board Reporter (OBR). Joining Skipper Charlie Enright of Bristol, RI (age 29) and General Manager Mark Towill, 25, of Kaneohe, HI are Nick Dana, 28, of Newport, RI; Alberto Bolzan, 32, of Trieste, Italy; Ryan Houston, 31, of Auckland, NZL; Will Oxley, 49, of North Queensland, Australia; and Dave Swete, 30, of Auckland, NZL. Amory Ross, 30, of Newport, RI is the team’s OBR. This is Nick Dana’s third VOR, but his first as a member of the race crew. Dana was with the PUMA Ocean Racing 2008-09 shore team and was the OBR for Abu Dhabi Ocean Racing in 2011-12. His ocean racing accomplishments include four Newport Bermuda Races, three Fastnet Races, a Middle Sea Race, a Transatlantic Race, and a recent defense of the King’s Hundred Guinea Cup with the J Boat Hanuman. Having worked for many years at his family’s business, Newport Shipyard, Nick can maintain and repair boats as well as he can race them. Amory Ross was PUMA Ocean Racing’s OBR in 2011-12 and was part of the video team for ORACLE TEAM USA’s successful defense of the 34th America’s Cup. The OBR has the unique role of sailing on board for the entire race but not contributing in any way to the performance of the boat. In addition to transmitting words, images and video of life aboard the team’s Volvo Ocean 65 Alvimedica, Amo’s duties include provisioning and food preparation. Team Alvimedica will select one more crewmember before the first event of the 12th edition of the VOR, the In-Port Race in Alicante, Spain on October 4. “With only eight race crew positions each role on board is vital,” said Enright. “Sailing skill is the main requirement but equally important is the team chemistry and ability to work together in a confined space for 38,000 miles around the world. 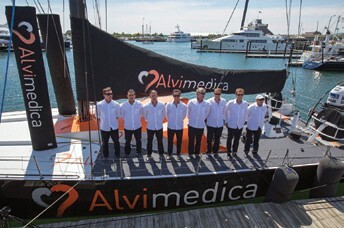 To achieve great results on the water we need a collaborative group who will look after each other’s safety and well-being throughout a range of challenging conditions.” Fans can follow the team at facebook.com/TeamAlvimedica and teamalvimedica.tumblr.com.